Blackmagic Design today announced Blackmagic Camera 2.3, which is a major update for Blackmagic URSA cameras. This new software adds support for HD window mode allowing 150fps recording in 1920 x 1080 resolutions, adds support for ProRes 444 XQ, allows recording onto 2 CFast 2 cards simultaneously in RAW allowing higher frame rates in RAW and also adds support for the new V2 4K URSA image sensor which allows Ultra HD capture to 120 fps. This new software update is available now to download from the BlackmagicDesign.com. The new “window mode” allows you to select up to 150 fps for slow motion effects when shooting in full HD. The window mode keeps data rates lower, even when running at high frame rates because it does not use the whole 4K image sensor, but takes a 1920 x 1080 resolution window from the center of the sensor. This allows the camera to capture to higher frame rates than possible when using the whole sensor. The new ProRes 444 XQ codec allows Blackmagic URSA cameras to record into the highest quality ProRes format and this allows incredible compatibility with both DaVinci Resolve and also Final Cut Pro X. ProRes 444 XQ is ideal when you need extremely high quality, but also need compatibility with a wide range of software that might not handle RAW files. This software update also allows recording RAW to two CFast 2 cards simultaneously. This allows every second RAW frame to be sent to alternate CFast 2 cards so the recording data rate is doubled in comparison to using a single card. Because CFast 2 cards are extremely fast, being able to use two of them at the same time when recording allows extremely high data rates, which is vital when recording RAW. Because the frame rate is not fixed in RAW files, this means shooting RAW is ideal for high frame rate shooting and is more flexible when customers need to change the speed of the clips during post production. This new Camera Update 2.3 also adds support for a new version of the URSA image sensor that allows higher frame rates. This new 4K v2 sensor is now rolling out in new URSA cameras and allows high frame rates full resolution 4K of up to 120 fps. This means customers can now go beyond 80 fps and up to 120 fps when running high resolution. 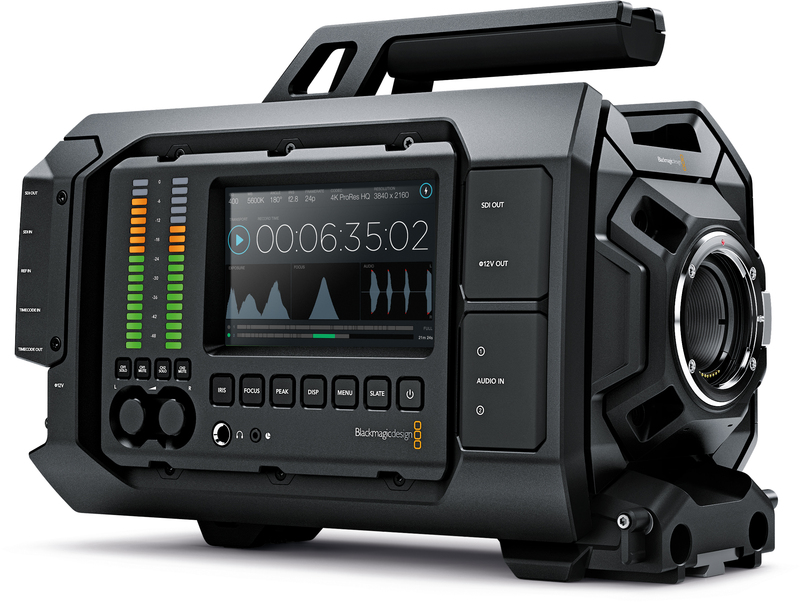 Because Blackmagic URSA is user upgradable, this new sensor will also be offered as an upgrade so customers can increase the frame rate of their URSA cameras if required. Details on availability and cost of this 4K v2 sensor update will be available late in April. Adds support for windowed recording up to 150 fps in 1920 x 1080 HD resolution. Adds new ProRes 444 XQ codec for recording and playback. Adds support for recording to 2 CFast 2 cards at the same time in RAW allowing higher frame rates. Adds support for new Version 2 4K image sensor for recording to 120 fps in 4K.